We stock a large quantity of toby and character jugs by all of the major manufacturers including Royal Doulton, Lancaster Sandland, SylvaC and Wood and Sons. Click a highlighted price to go to our secure ecommerce site www.iauctionshop.co.uk where you can purchase the item. 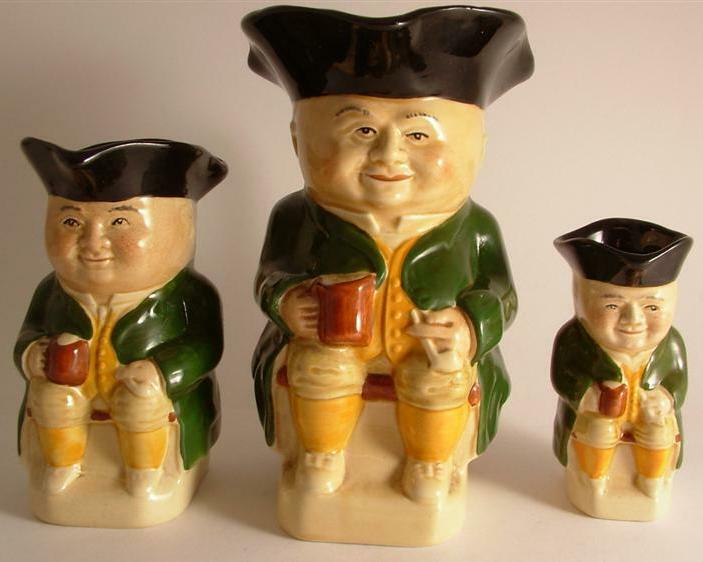 A set of three graduated Wood & Sons seated Toby jugs. In sizes 2, 3 and 4 being respectively 6 inches, 4.5 inches and 3.5 inches high. All are in good condition free from chips cracks or repairs. 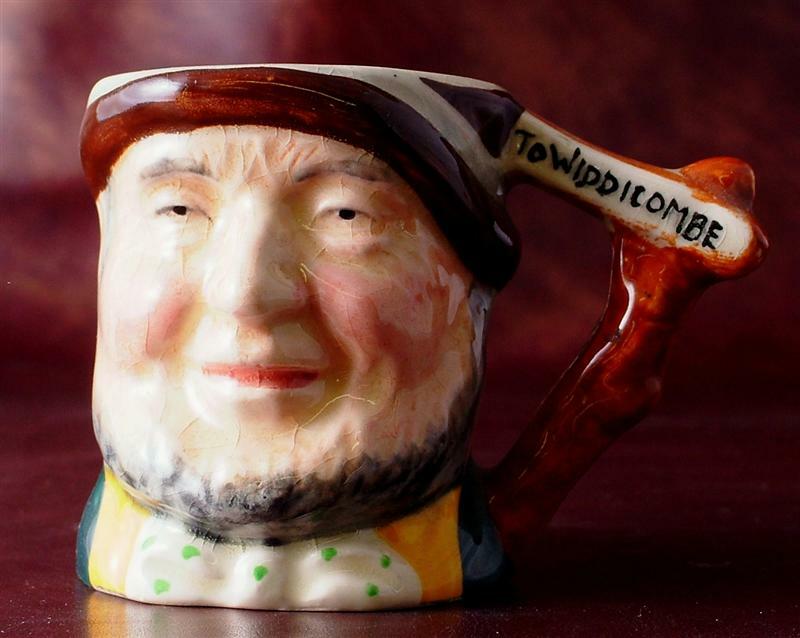 A hand made and decorated treacle-glazed toby jug by Dartmouth Pottery of Devon. Stands about 4.25 inches high. A small chip to the rim has been professionally touched up by our ex Royal Doulton model maker and artist. 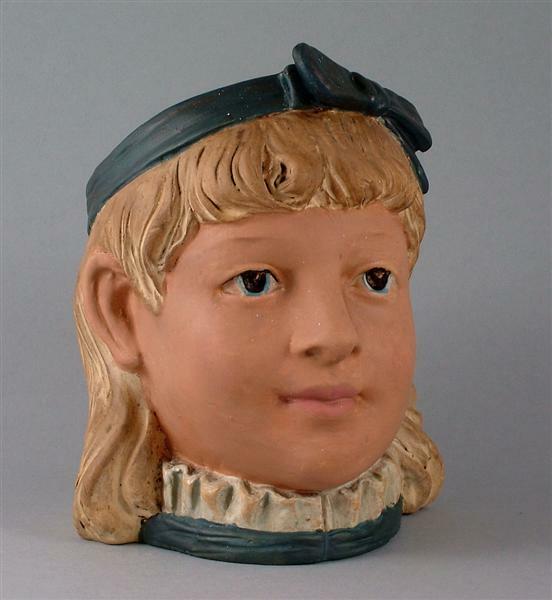 A delightful Bernard Bloch, of Eichwald, Bohemia, Germany tobacco jar or humidor in the form of a blue eyed girl's head. Missing its cover, but still a most stylish piece. Measures approximately 5 inches in height. Some age related wear, (she is after all about 115 years old), but generally in very good condition. 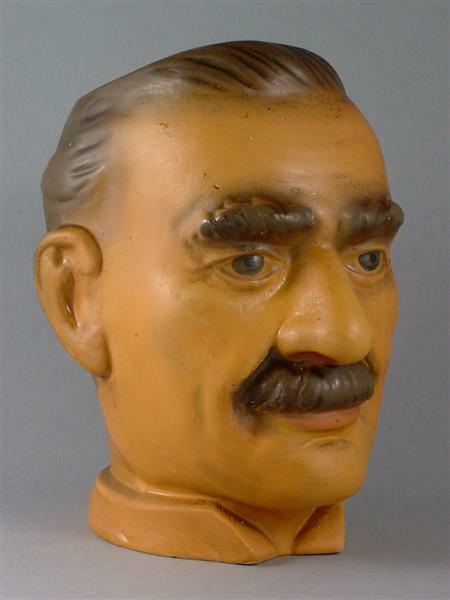 A good character jug in the form of Neville Chamberlain, British Prime Minister between 1937 and 1940 - known as the Appeaser after his signing of the Munich Agreement with Adolf Hitler in 1938. Some age related wear and very minor scrapes but overall in good condition. 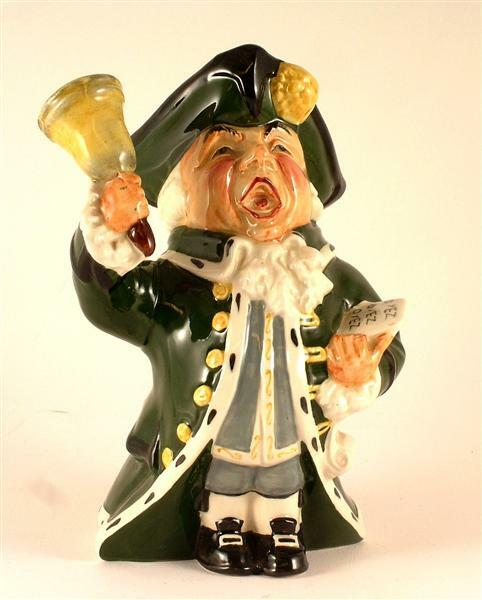 A Roy Kirkham Town Crier character jug. Stands approximately 7 inches high. He appears in full flow ringing his bell and with 'O YEZ, O YEZ, O YEZ' written on the pad that he is carrying. In perfect condition without chips, cracks or repairs. Small Creamer/Jug. Character/Toby Jug. Has the manufacturers mark on the underside of: 'Lancaster Sandland, Handpainted, Hanley, England, Sandland Character Ware'. 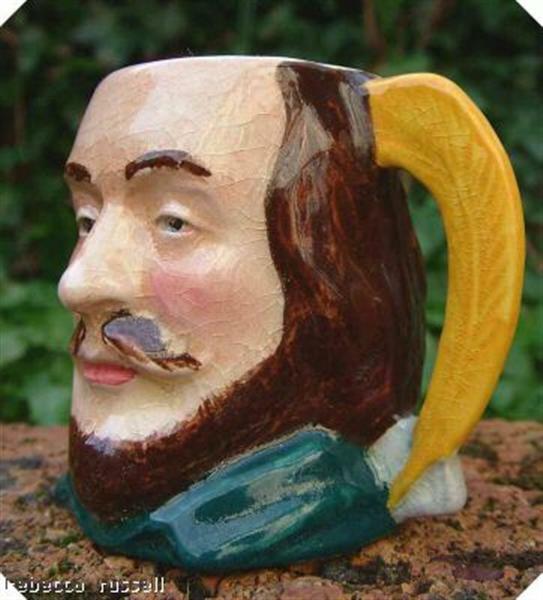 Character is William Shakespeare. Yellow feather handle, blue coat. In good condition with no chips or cracks. There is some crazing to the glaze. Measures approx: 2 2/3 inches (7cm) in height and 1 2/3 inches (4 1/2 cm) in diameter. Weight, unpackaged, is 85g. Additional photographs are available on request. Small Character Toby jug/creamer. Manufacturers printed mark on the underside: 'Sandland Character Ware. Lancaster Sandland, Handpainted Hanley England'. Imprinted on the reverse is 'Raleigh' for Sir Walter Raleigh. Blue coat with white ruffle. Black hat with feather on the back. Grey pipe for handle. In good condition with no chips or cracks. Measures approx: 3 inches (8cm) in height and 1 1/2 inches (4cm) in diameter. Weight, unpackaged, is 135g. Additional photographs are available on request. Character/Toby Jug/Creamer. Tubby. c1960. Has the manufacturers printed mark on the underside of: 'Burlington Ware, Made in England, Tubby'. Turquoise coat, yellow waistcoat, Burgundy trousers, black hat and handle. In general good condition. There are, however, 2 tiny 'flea bite' chips to the rim. Additional photographs are available on request. Character/Toby Jug/Creamer. c1960. Has the manufacturers printed mark on the underside of: 'Burlington Ware, J Shaw & Sons Ltd, England. Character unknown. Oriental looking man. Blue trousers and waistcoat. Is holding a glass in one hand and a brown bottle in the other. Grey hat. In good condition with no chips or cracks. Measures approx: 5 inches (13cm) in height and 2 inches (5cm) in diameter. Weight, unpackaged, is 200g. Additional photographs are available on request. 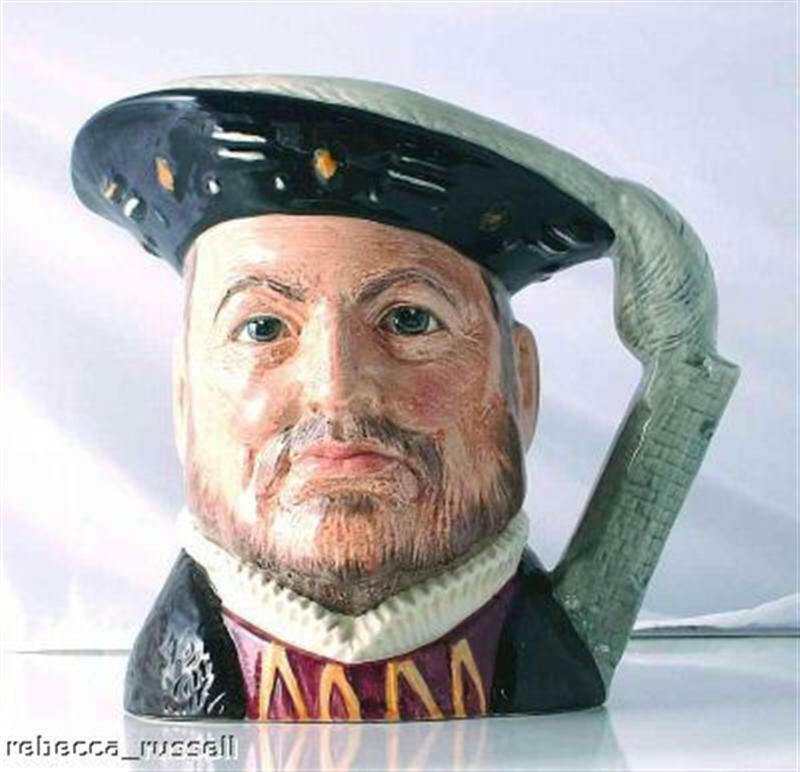 Royal Doulton toby jug or character jug, Henry VIII, designed by Eric Griffiths during the period of 1975 and 2000. Clearly marked to the base with the Royal Doulton mark, first quality, and in good condition with no chips or cracks. Measures 6 1/2 inches (16.5 cm) in height. Weighs unpackaged 660 grammes. Additional photographs are available on request. 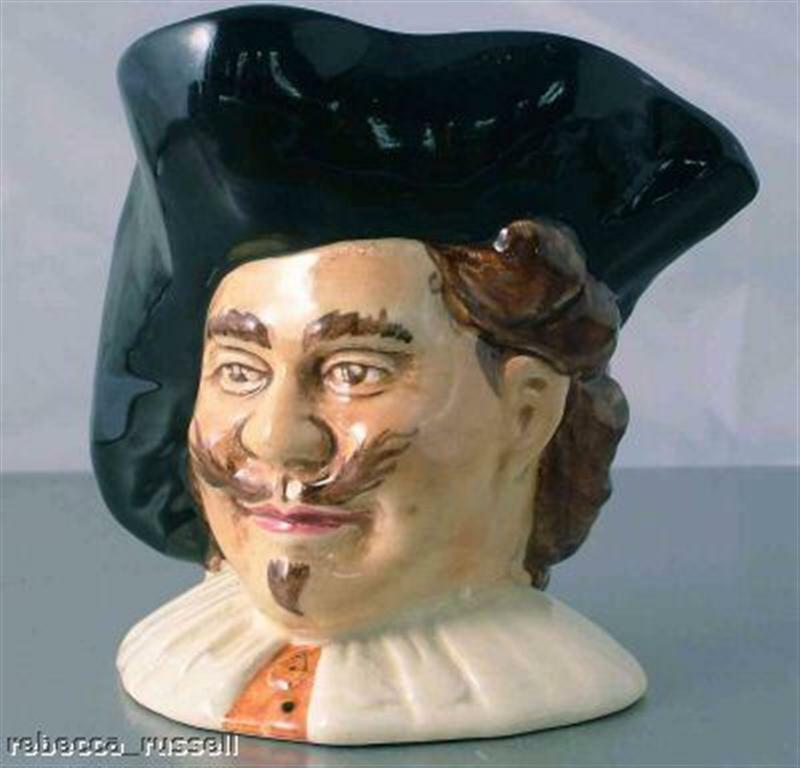 A SylvaC New Cavalier character jug or toby jug dating to between 1945 and 1955. Stands about 4 1/2 inches 11.5cms and weighs 330g. In excellent condition with no chips, cracks or repairs. Light crazing to the glaze. Clearly marked to the base Sylvac England Hand Painted. Additional photographs are available on request. 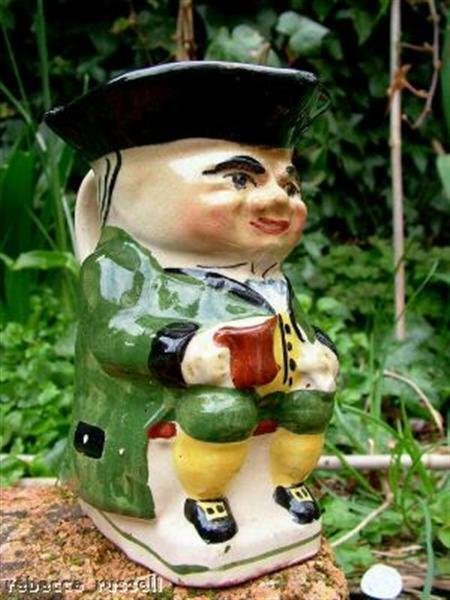 A Royal Doulton D6462 Pied Piper character jug or toby jug. 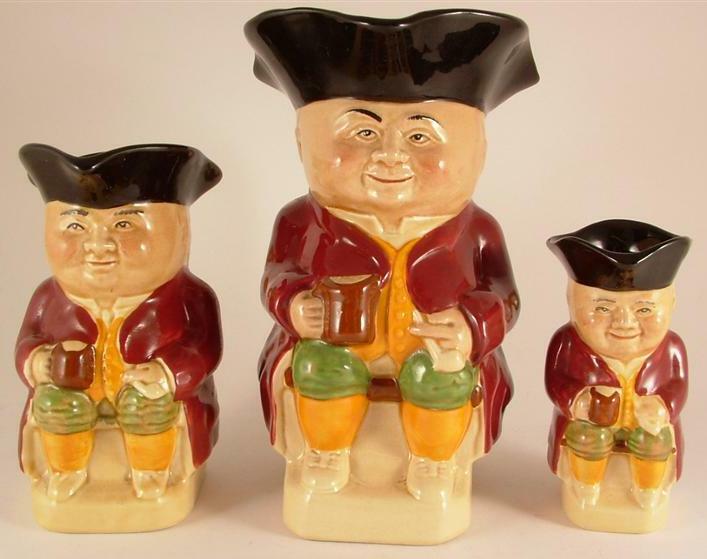 Purchased by our Client's father in 1957, the year of issue in this size, and in an unusual colourway - most of these jugs had the Piper's hair in brown. This chap's has been painted grey. Designed by Geoff Blower. Stands about 3 3/4 inches 9.5cms high and weighs 200g. No chips, cracks or repairs. No crazing to the glaze. Additional photographs are available on request. 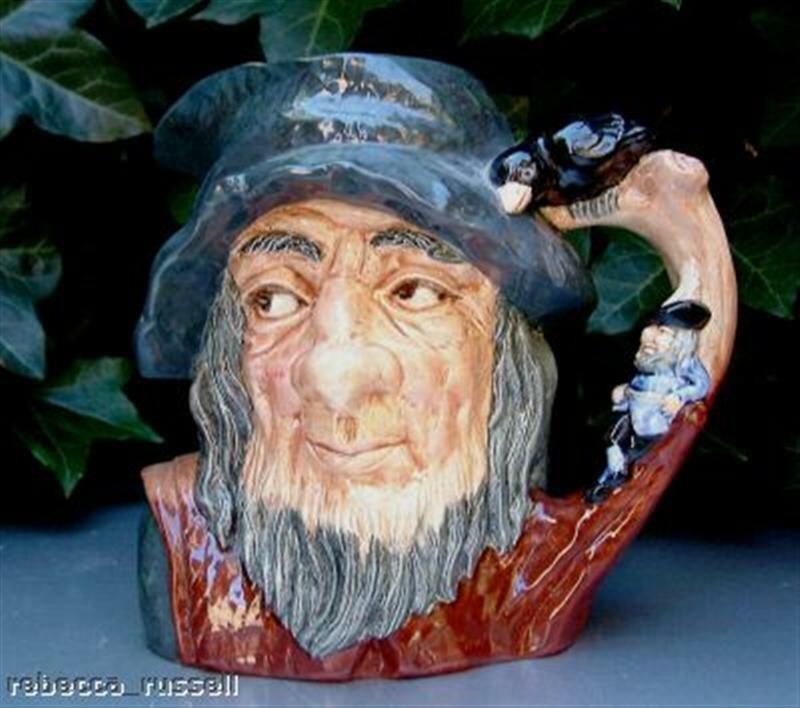 Rip Van Winkle toby jug or character jug, small, measuring 4 inches (10.1 cm) in height. Designed by Geoff Blower, and depicts a man resting against a trunk of a tree, with a blackbird sitting atop of it. The story of Rip Van Winkle, written by Washington Irving, is based on legends from Dutch settlers. While walking in the Catskill Mountains of New York, Rip drinks a fairy potion, falls asleep for 20 years and wakes to find an unrecognisable world. In good condition, with no chips or cracks. Clearly marked to the base with the Royal Doulton mark, first quality. Weighs unpackaged 200 grammes. (Client - PC). Additional photographs are available on request. 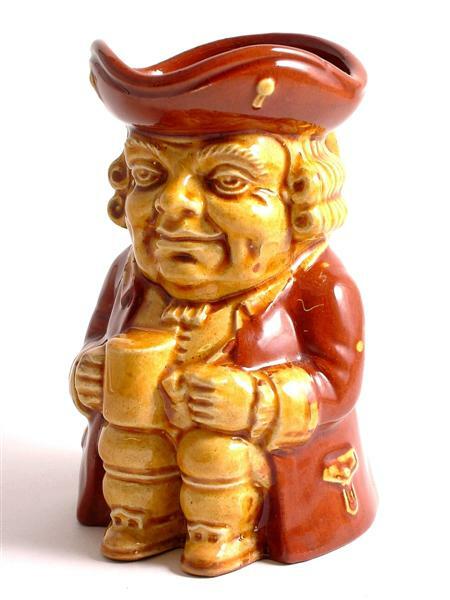 A Wedgwood & Co pottery toby jug or character jug. The Lord Mayor. Stands about 7 1/4 inches 18.5cms high and weighs 500g. In original condition with no chips, cracks or repairs - light crazing to the glaze only - and with its original Wedgwood & Co sticker still present. Additional photographs are available on request. A bygone or vintage Kelsboro Ware toby jug or character jug. His handle is in the form of a key - possibly the watchman. Stands about 3 1/2 inches 9cms high and weighs 150g. One hairline to the base. Still perfectly useable as a jug and ideal for display. Additional photographs are available on request. Super Wain and Sons toby jug, manufactured in Longton, Staffordshire Potteries. Clearly marked to the base with the Wain and Sons mark, and imprinted with Tale Teller reg Applied For MS. In good condition, with no chips or cracks, and measures 7 1/2 inches (19 cm) in height. Weighs unpackaged 560 grammes. Additional photographs are available on request. 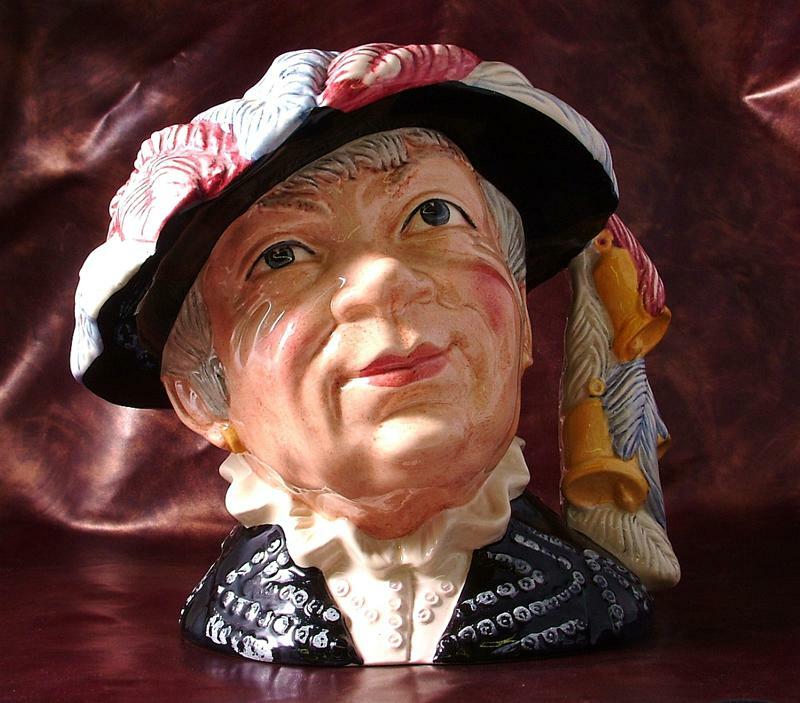 Beswick toby jug or character jug, Mr Micawber from Dickens David Copperfield. Designed by Mr Watkin, and introduced 1939 and discontinued in 1973. Clearly marked to the base with the Beswick England stamp, and also imprinted prior to firing with Beswick England 674 Mr Micawber. In good condition with no chips or cracks, slight crazing to the glaze but mainly to the base only. Face area is pretty much clear of crazing, except a small area under the nose. Measures 3 1/4 inches (8 1/2 cm) in height, and weighs unpackaged 150 grammes. Additional photographs are available on request. Sandland toby jug, character jug or creamer, Weller. Charming fellow with yellow necktie, and clearly marked to the base with the Sandland Lancaster mark. Although in good condition, there is general crazing to the piece, and has had a small area of restoration by our professional restorer near the spout area. Now free from any chips or cracks, and a charming piece to be displayed and enjoyed. Measures 3 inches (7 1/2 cm) in height, and weighs unpackaged 100 grammes. Additional photographs are available on request. 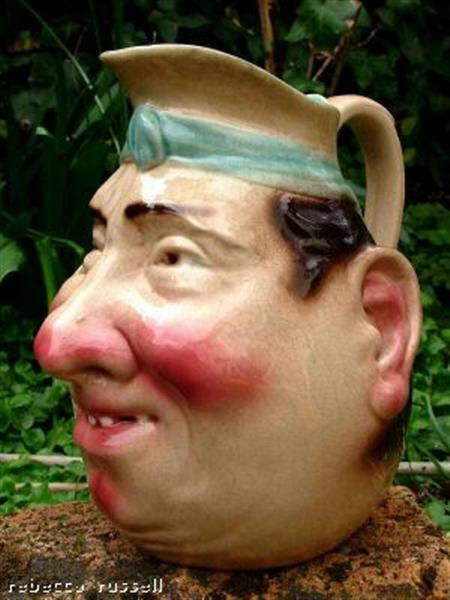 A superb and characterful face or character jug from Sarreguemines in France - the home of faience. A ruddy featured happy looking, (if a little toothless), chap with much crazing to his glaze and just one minute glaze scrape to the rim. The usual pale blue interior and clear stamps to the base including the pattern 3181. Stands an unusually large 8 1/2 inches 22cms high and weighs 1100g. Additional photographs are available on request. Charming Torquay ware toby jug, in good condition with no chips or cracks. Earthenware with some crazing, and marked Torquay Pottery to the base. Measures 5 1/2 inches (14 cm) in height, and weighs unpackaged 435 grammes. Additional photographs are available on request. 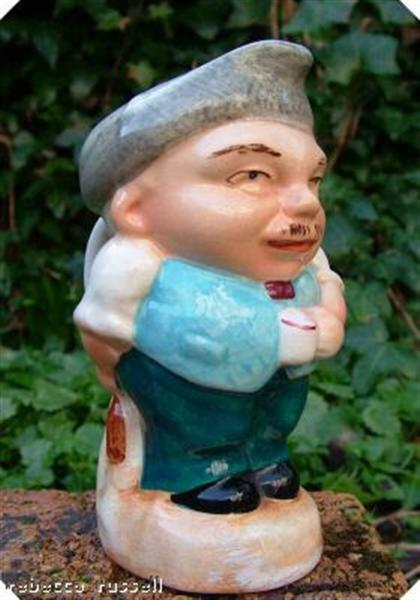 Auld Mac, Toby Jug manufactured by Royal Doulton, issued in 1937-1985. Designed by Harry Fenton. A brier handle, Green tam; brown coat. Doulton number; D5824 (small). Measures 3 1/4 inches (8.3 cm), 4 inches (10 cm) in width (measured from handle to spout from above). Weighs 130g unpackaged. Additional photographs are available on request. 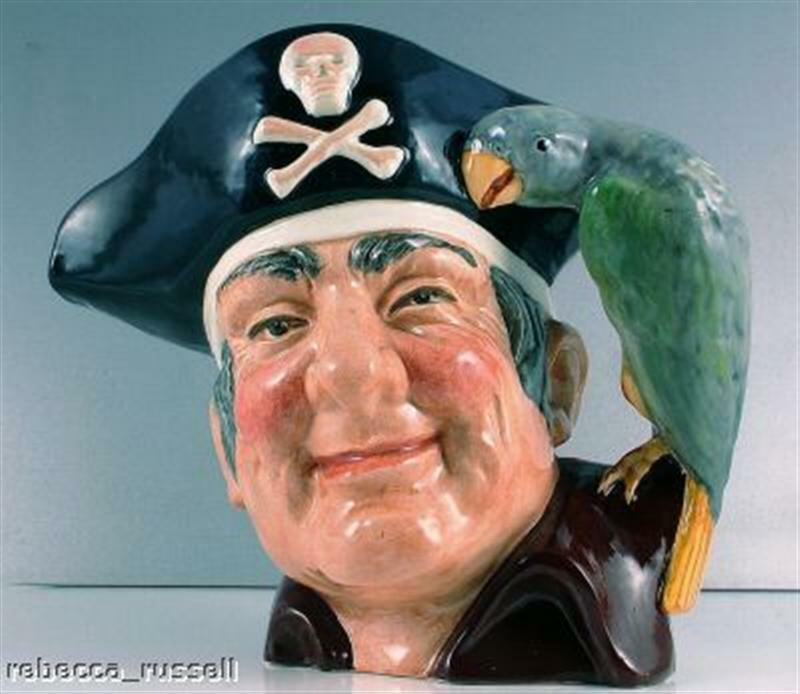 Sancho Panca, Toby Jug manufactured by Royal Doulton, designed by Geoff Blower. Light brown donkey handle, black hat with a white feather; black coat with a white collar. Characters from Literature series. Royal Doulton number; D6456, Large. Measures 6 1/2 inches (16.5 cm) in height, 7 inches (18 cm) in width (measured from handle to spout from above). This amiable peasant was employed as the squire to Don Quixote in Cervantes's 17th century novel. Accompanying Quixote on many adventures, his down to earth common sense acted as a foil to his master's romantic musing. Additional photographs are available on request. 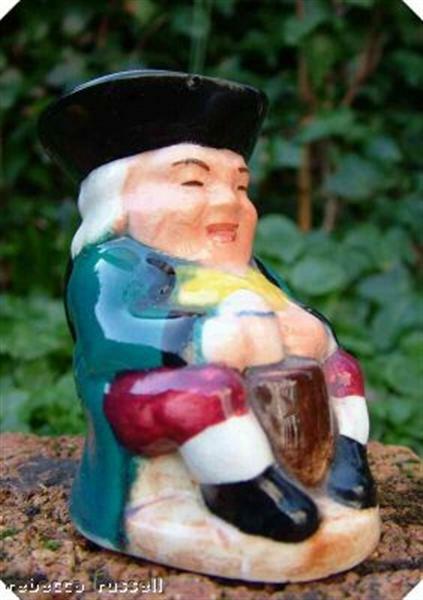 Rip Van Winkle, Toby Jug manufactured by Royal Doulton issued 1955-1995. Designed by Geoff Blower. From the Characters from Literature series. Grey blue cap; brown robes; figure dressed in blue resting against a tree. Doulton number: D6438. Measures 6 1/2 inches (16.5 cm) in height and width (width from handle to spout measured from above). Inspired from 1820, the American writer Washington Irving wrote the story of Rip Van Winkle, based on legends he had heard from Dutch settlers. While walking in the Catskill Mountains of New York, Rip drinks a fairy potion, falls asleep for 20 years and then awakes in an unrecognisable world. Additional photographs are available on request. 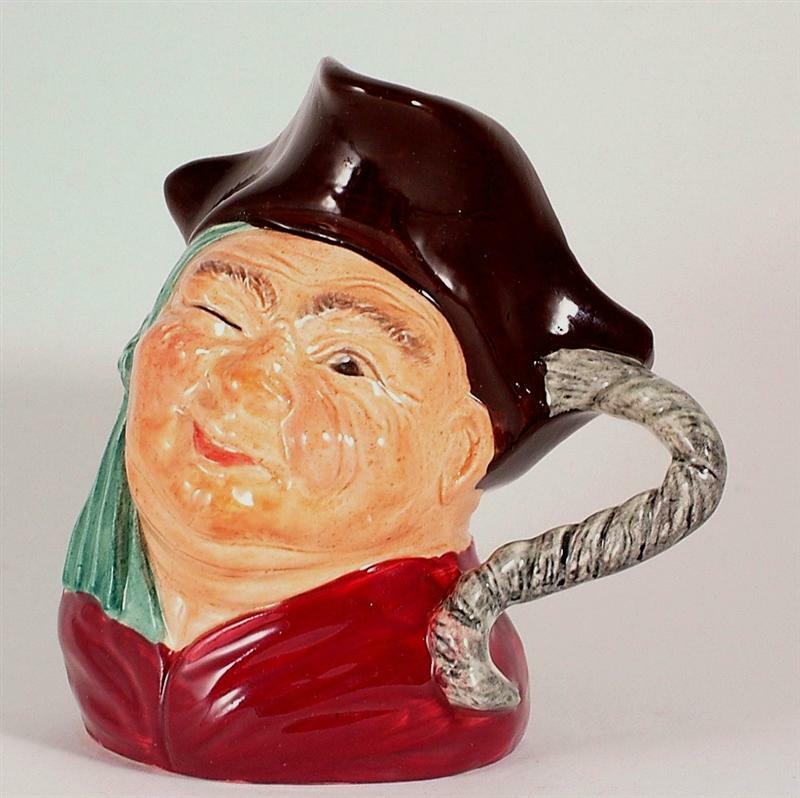 Stunning Royal Doulton Character Jug or Toby Jug, Trapper, D6609. An integral part of Canadian History, the early trappers or voyageurs, were largely responsible for the early exploration of the country. This piece is first quality, and clearly stamped to the base, large in size. In good condition with no chips or cracks. Measures just under 7 1/4 inches in height, and weighs unpackaged 900 grammes. Additional photographs are available on request. Beswick character jug or cream jug, with the handle in the form of a key. Mr Varden, clearly marked to the base as such and imprinted with the number 1204. Dates between 1950 and 1973. General crazing to the piece, and a good restoration done to the handle by our professional restorer. This is now a good piece with no chips or cracks. Measures approximately 3 1/4 inches (8 cm) in height. Weighs unpackaged just under 150 grammes. Additional photographs are available on request. 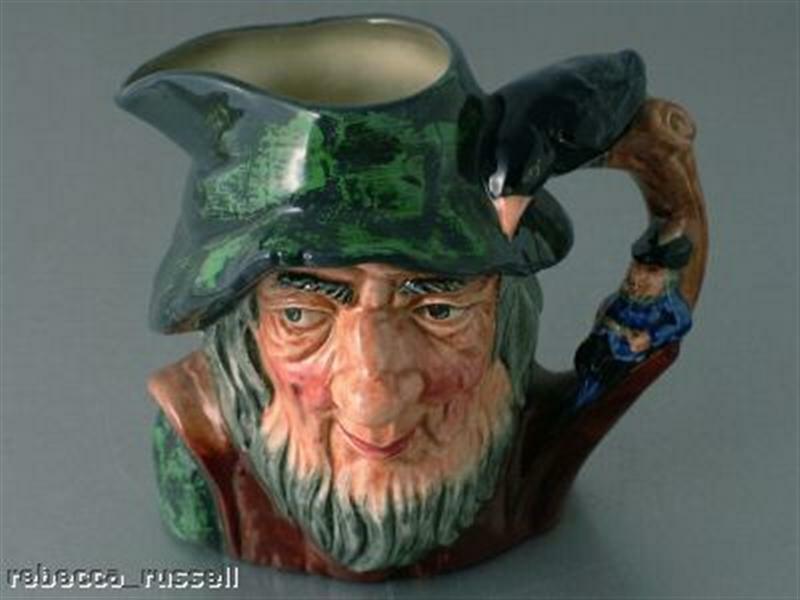 c1950 Lancaster and Sandland Ware character jug or toby jug from Dickens Midsummer Night's Dream. Puck. Clearly marked to the base with the mark for the period, and in good condition with no chips or cracks. Some general crazing to the glaze. Measures 2 1/2 inches (6 cm) in height, and weighs unpackaged 100 grammes. Additional photographs are available on request. Charming Beswick character teapot and lid, Peggotty, and marked as such to the base. Also imprinted with 1116 and Beswick England. Designed by Arthur Gredlington. Introduced in 1948 and discontinued in 1973. In good condition, with no chips or cracks. Measures 5 1/2 inches (14 cm) in height from the table to the tip of the lid finial, and measures 8 inches (20 cm) in width from the tip of the spout to the edge of the handle. Weighs unpackaged just under 600 grammes. Additional photographs are available on request. Toby/character jug. 'The Gardener'. Most probably manufactured by Royal Doulton. D6634. Manufactured 1973-1981. Retired. Variation 2. Colour way - yellow scarf, white shirt, light brown hat. Handle - A spade and vegetables. Measures approx 4 inches (10.1cm). Weight, unpackaged, is 240g. In good condition with no chips or cracks. This has no marks to the base, so believe that this piece was taken from the factory prior to back stamp firing. Additional photographs are available on request. Toby/character jug. Most probably manufactured by Royal Doulton. D5528. Manufactured 1935-1986. Retired. Characters from literature. 'Sairey Gamp', the gossiping, gin-drinking midwife and nurse in Charles Dickens Martin Chuzzlewit. Variation no 1. Designed by Leslie Harradine and Harry Fenton. Colourway- grey hair, light green band; dark green coat, yellow and burgundy bow. Handle - green umbrella. Measures approx 3 1/2 inches (8.3cm). Weight, unpackaged, is 210g. In good condition with no chips or cracks. This has no marks to the base, so believe that this piece was taken from the factory prior to back stamp firing. Additional photographs are available on request. Toby/character jug. Characters from literature. 'Athos'. Most probably manufactured by Royal Doulton. One of the original musketeers in the 19th century novel by Alexandre Dumas. Designed by Max Henk. Colourway is Black hat white feather, green tunic with gold trim. Variation no 1. D6452. Manufactured 1956-1991. Retired. In good condition with no chips or cracks. Measures approx 3 3/4 inches (9.5cm). Weight, unpackaged, is 220g. This has no marks to the base, so believe that this piece was taken from the factory prior to back stamp firing. Additional photographs are available on request. Toby/character jug. Most probably manufactured by Royal Doulton. Characters from literature. 'Robinson Crusoe'. Based on the Daniel Defoe novel written in 1719. Variation 2, without footprint on shoulder. Designed by Max Henk. Colourway is brown and green. The handle is a palm tree. The man Friday peers from behind the palm tree. In good condition with no chips or cracks. Measures approx 3 3/4 inches (9.5cm). Weight, unpackaged, is 180g. This has no marks to the base, so believe that this piece was taken from the factory prior to back stamp firing. Additional photographs are available on request. 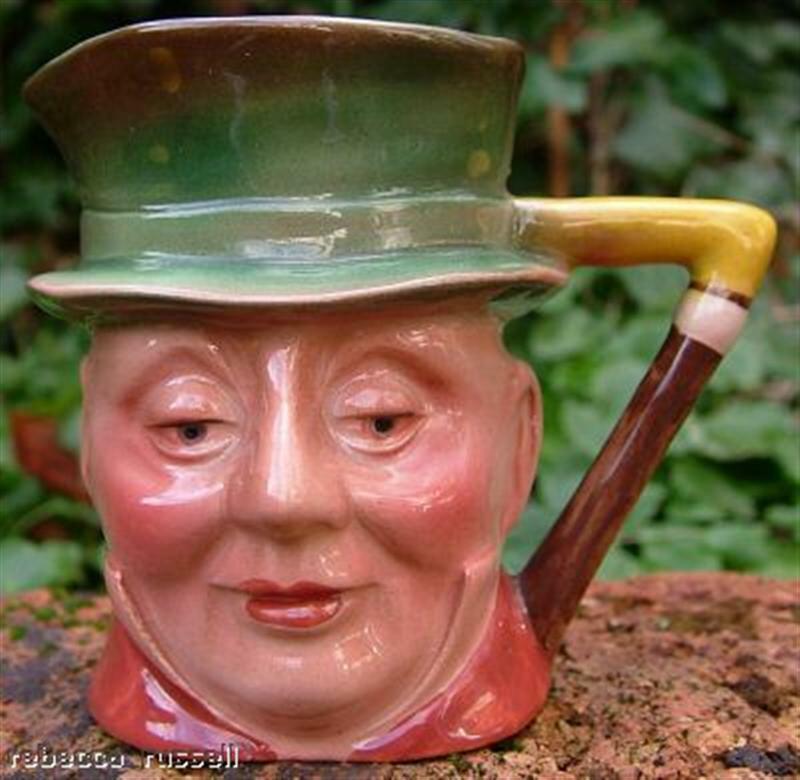 Toby/Character Jug by Royal Doulton. D5843, Rd No 822825. Date of manufacture 1938-1948. Retired. Charles Dickens Character. Wilkins Micawber is a character from David Copperfield and is landlord and friend. Plain handle with black hat, green coat ad blue polka-dot bow tie. Mid size 4 1/4 inches (10.8cm) in height. Weight, unpackaged, is approx 230g. In good condition with no chips or cracks. Additional photographs are available on request. 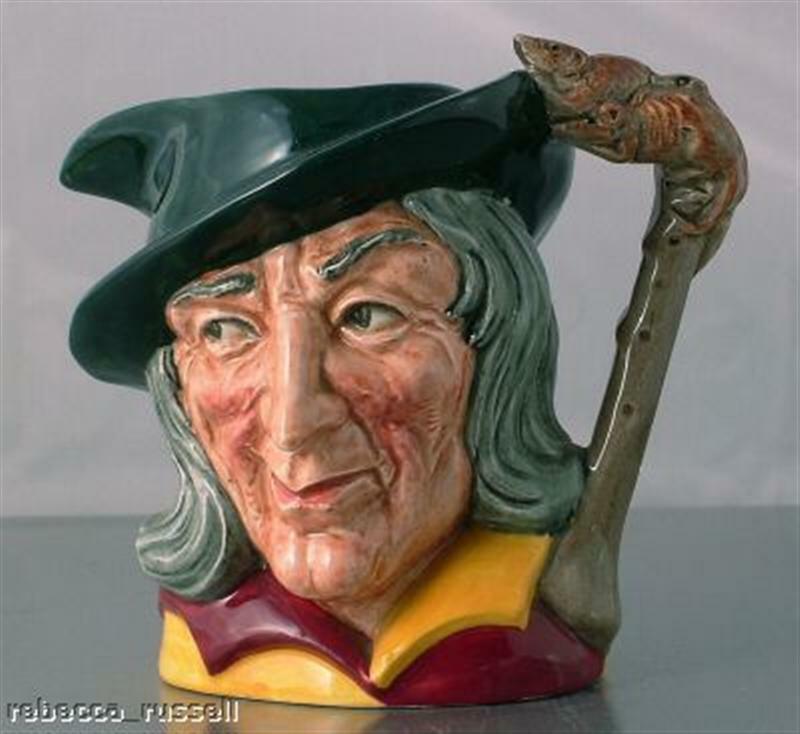 Royal Doulton Toby/Character Jug. Backstamp 'Falstaff'. Sir John Falstaff is a fat, good humoured braggart who figures in Shakespeare's Henry IV and 'The Merry Wives of Windsor'. Designed by Charles Noke. Has a plain handle, burgundy clothes and a black hat with burgundy feathers. Initially believed to be D6063 from Variation 1. However, research on Royal Doulton shows that all mugs in variation 1 appear to be large size. This particular mug is small in size, 5 1/2 inches (14cm). This could possibly be a crossover model, in between styles or indeed a rare model. 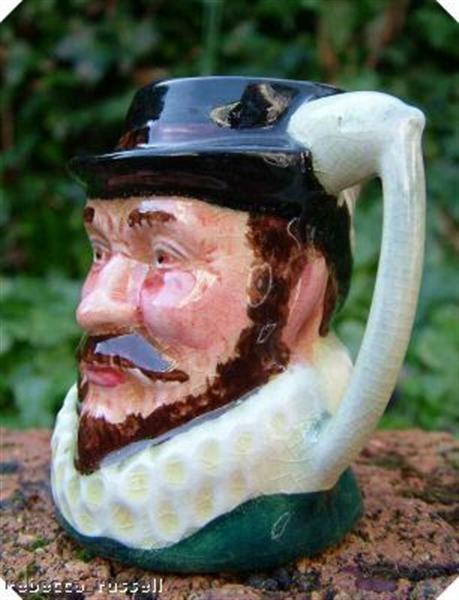 The detail which is important is that the hand holds the mug of ale away from the chest. Date of manufacture 1939-1991. Retired. Weight, unpackaged, is 315g. In good condition with no chips or cracks. There is, however, slight crazing to the glaze in places. Additional photographs are available on request. 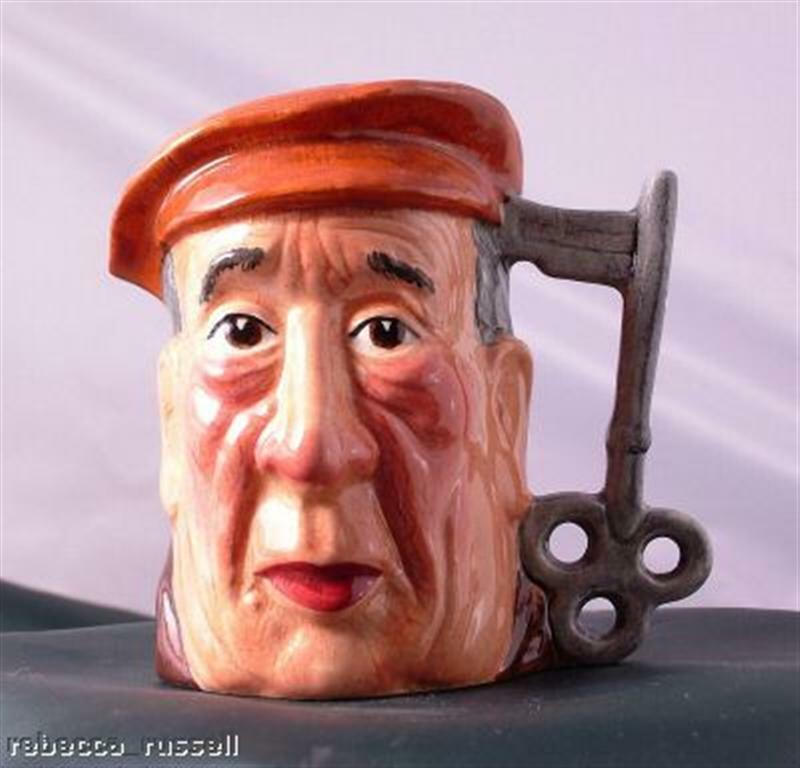 Royal Doulton Toby/Character Jug. Variation 1. Series character from literature. 'Rip Van Winkle'. D6517. Date of manufacture 1960-1991. Retired. Designed by Geoff Blower. Size miniature, 2 1/2 inches (6.4cm). Colourway, grey-blue cap, brown robes, figure dressed in blue resting against the trunk of a tree. Handle is Blackbird sitting atop the trunk. Details on underside: Copr 1954. Rd no, 874255, 7022, 32854, 193/54. In good condition with no chips or cracks. Weight, unpackaged, is 70g. Additional photographs are available on request. 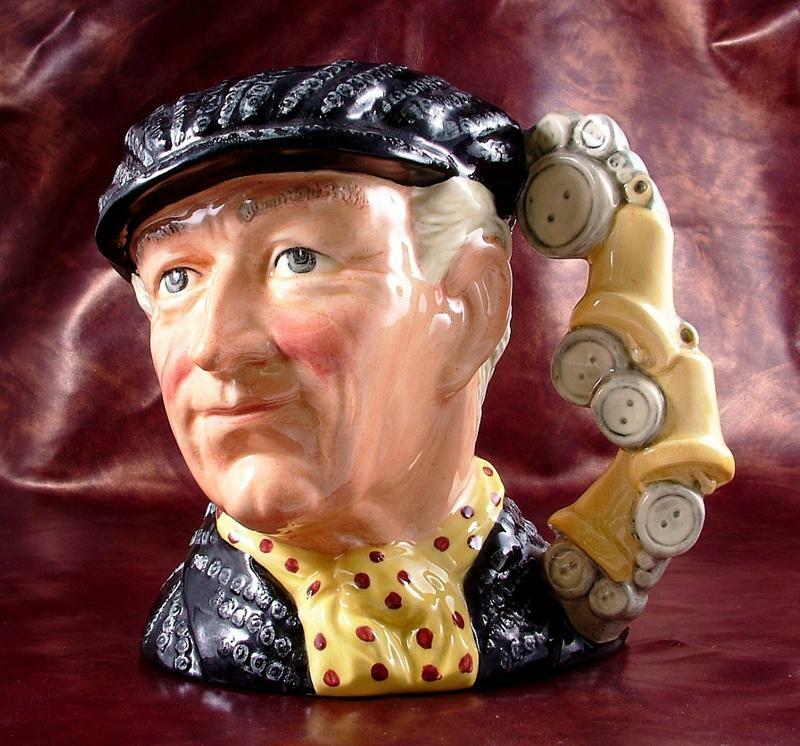 Toby/Character Jug by Royal Doulton. D6386. Date of manufacture 1952-1998. Retired. Small size 4 inches (10.1cm). The character is Long John Silver from Robert Louis Stevenson's 'Treasure Island'. Designer is Max Henk. Handle is a grey parrot. Has a black hat with skull and crossbones and a maroon shirt. In good condition with no chips or cracks. Weight, unpackaged, is 255g. Backstamp is present to the base of this jug, although appears as a transfer. This has because the piece was taken from the factory prior to final firing stage. Additional photographs are available on request. Toby/Character Jug, possibly a creamer as this item has a small spout. 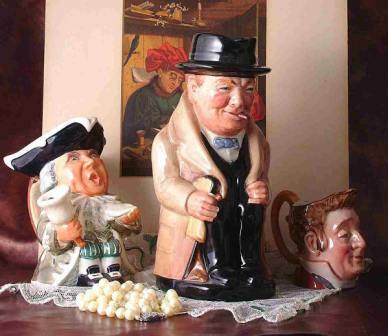 Manufactured by Beswick, England. The character is Seth Pecksniff, an architect/surveyor from Martin Chuzzlewit by Charles Dickens. Discontinued in 1973. Plain handle. Colourway is deep red coat and blue cravat. Small size 3 1/2 inches (9cm). Weight, unpackaged, is 140g. In general good condition. There is however, what appears to be a short hairline close to the handle on the inside of item. Not visible from the outside, it seems to be affecting the glaze only. A lovely piece. Additional photographs are available on request. 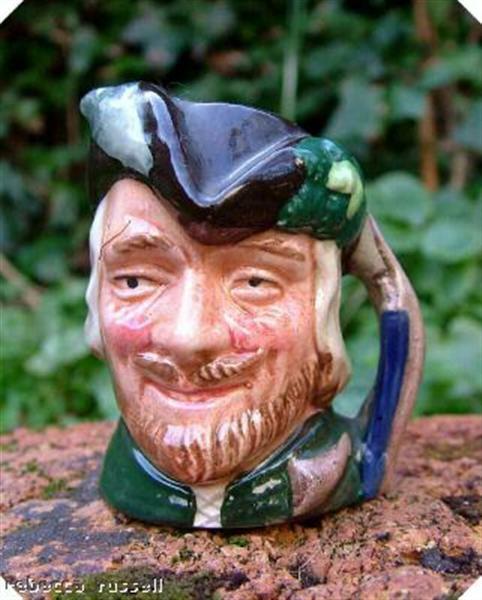 Royal Doulton miniature toby jug or character jug, Robin Hood, D6541. Manufactured between 1960 and 1991, by designer Max Henk. The mark above the eye is not on this item, jug is free from any chips cracks or imperfections. Measures 2 3/4 inches (7 cm) in height, and weighs unpackaged 75 grammes. Additional photographs are available on request. 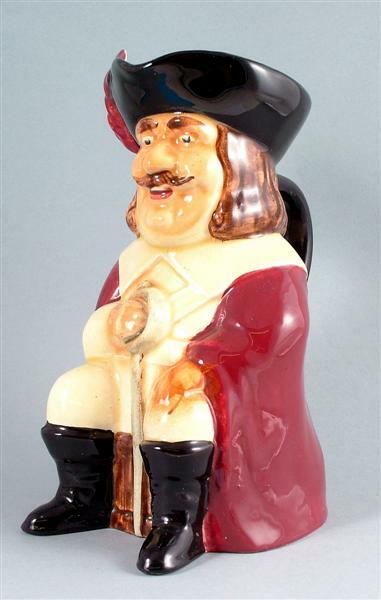 Super Royal Doulton character Toby Jug, Sir Francis Drake. Clearly marked with the Royal Doulton mark to the base, and in good condition with no chips or cracks. Measures 3 1/4 inches (8 cm) in height, and weighs unpackaged 200 grammes. Additional photographs are available on request. Royal Doulton large character jug or toby jug, Sairey Gamp. Clearly marked to the base with the Royal Doulton mark but not marked with the Royal Doulton D number, most probably D5451. In good condition, with no chips or cracks or any known restoration. Measures 6 1/4 inches (16 cm) in height. Weighs unpackaged 650 grammes. Additional photographs are available on request. 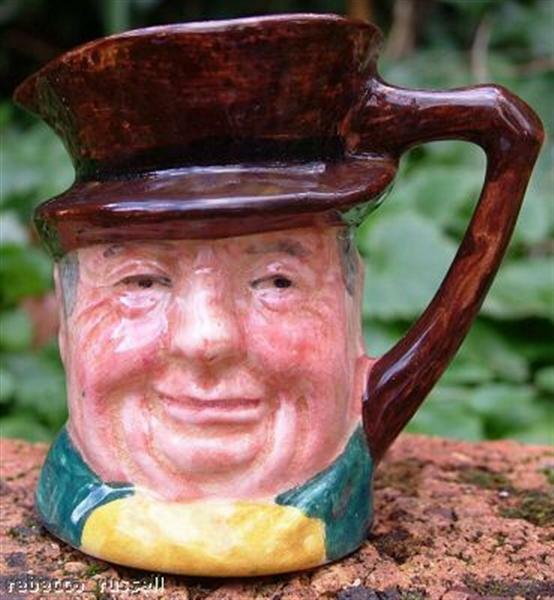 Charming Royal Doulton Character Jug or Toby Jug, of Winston Churchill. Clearly marked to the base with the Royal Doulton mark, and comes in good condition with no chips or cracks or signs of restoration. Imprinted with 8360 to base. Measures 8 1/2 inches (22 cm) in height, and weighs unpackaged 625 grammes. Additional photographs are available on request. 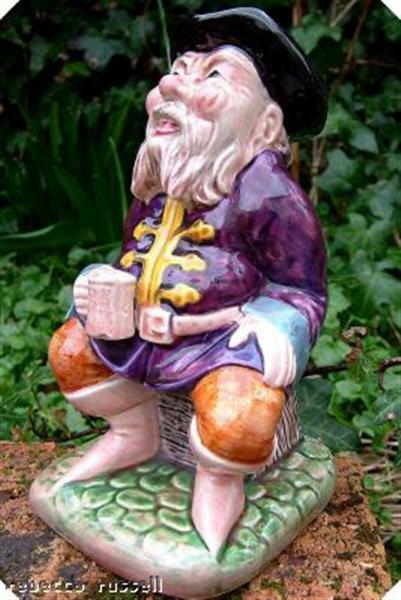 Shorter and son Toby Jug or Character Jug Fisherman. In good condition with no chips or cracks. Measures 4 inch (10 cm) in height. Weighs 215 grammes unpackaged. We currently have three of these Toby Jugs in stock. Please bear in mind the paintwork to each one may be slighly different. Additional pictures available on request. 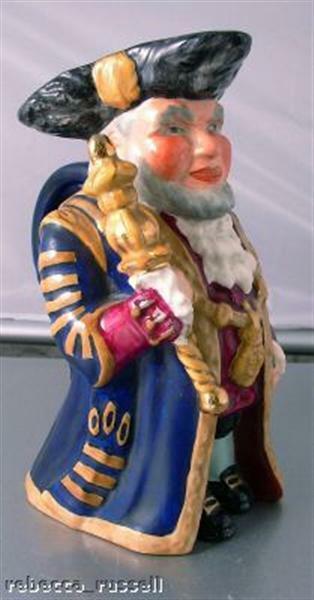 Shorter and son Toby Jug or Character Jug Father Neptune. A bearded man with a Sea horse or Seahorse handle. In good condition with no chips or cracks, although very light crazing to the glaze. Measures 3 1/2 inch (9 cm) in height. Weighs 240 grammes unpackaged. Lancaster Sandland ware Toby Jug or Character Jug To Widdicombe. In good condition with no chips or cracks, although some slight crazing to the glaze. Measures 2 1/2 inch (6 cm) in height. Weighs 100 grammes unpackaged. 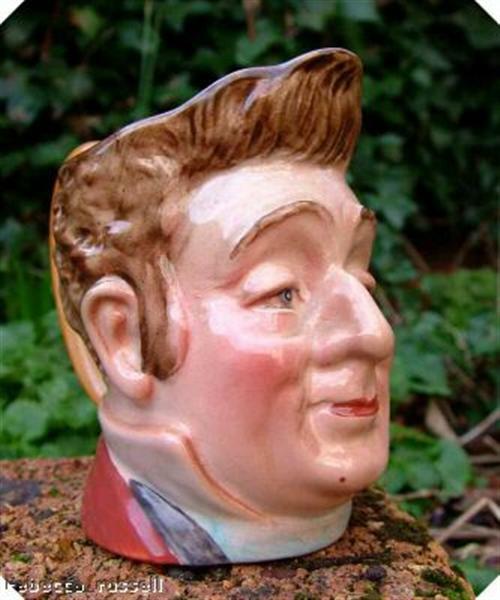 We currently have two of these Toby Jugs in stock, please be aware the paintwork detail may be slightly different. Additional pictures available on request. A super large Shorter and Son toby jug or character jug called Scottie. Fully stamped to the base L/S SCOTTIE, SHORTER ENGLAND and with tha Crown Devon stamp from their period of ownership, (1964 to 1970). Light crazing to the glaze but no cracks or chips or repairs of any kind. 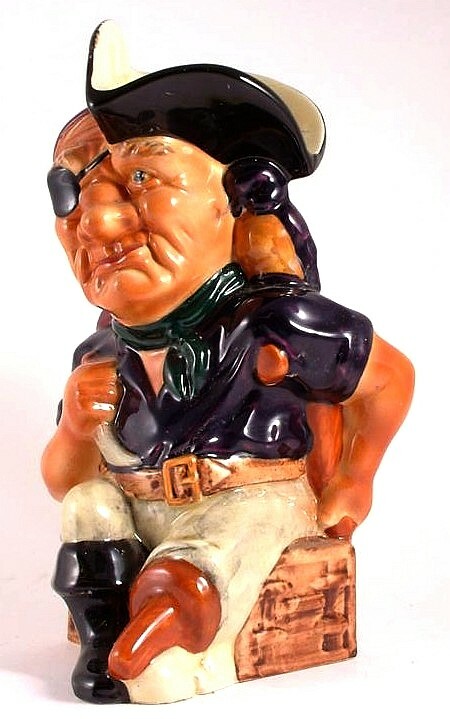 Royal Doulton Pearly King large toby jug, measuring approximately 7 inches in height. The Pearly King is the head spokesman for the street-market costers of London. Over a hundred years ago, his chief mandate was as a go-between for the costers and the London police. Today the Pearlies have turned their energy to raising money for charity. In good condition. Royal Doulton Pearly Queen large toby jug, measuring approximately 7 inches in height. The Pearly Queen, like the Pearly King, is the chief spokesperson for the street-market costers of London. The office is both hereditary and elected. In good condition.